Bishop Cardinal Fulvio della Corgna called the Jesuits to Perugia in 1551 and provided accommodation for them in Palazzo Vescovile. Bishop Ippolito della Corgna gave them the site of the old church of Sant' Andrea in 1561. (Cardinal Francesco Armellini had acquired the site in 1520 for a college that he proposed to build, but his death in 1527 had led to the abandonment of the project). A community of Capuchin nuns that had built the church and nunnery of Santa Chiara in 1552 came under their spiritual guidance in 1556. Cardinal Fulvio della Corgna financed the early stages of construction of a new church and adjacent college and convent to a design by the Jesuit architect Giovanni Tristano. The foundation stone of the church was laid in 1562, but construction was still in progress when it was consecrated in 1571, no doubt because of the difficulties posed by the position of the site on the edge of a precipice. The rectangular apse and the three oratories below it (see below) were built in 1586-1603 by Valentino Martelli, to a design by Giovanni de Rosis. The vaulting of the nave was finally carried out in 1620, but the facade remained incomplete until the 20th century (see below). The Jesuits were expelled following the suppression of their order in 1773 and replaced by a community of Barnabites from Sant’ Ercolano. They in turn were expelled in 1810, and returned in 1837 to find the church in a poor state of repair. They were expelled again in 1860. The ex-convent (to the right of the church) was incorporated into the complex of the Tribunale di Perugia (the Perugian law courts and associated offices) at that time. The Barnabites took refuge in the palace of Bishop Gioacchino Pecci for about ten years, until a few of them managed to return to il Gesù. The Barnabites still officiate at the church. The upper part of the façade of the church was finally completed in 1934 by the architect Eduardo Vignaroli, in accordance with a detail of a panel from the ex-convent that is now in the Galleria Nazionale (see below). A fire in 1989 devastated the nave of the church, and destroyed its gilded ceiling. Most of the altarpieces in the aisles were also lost. The church was restored as far as possible in 2001. The interior has a wide central nave with side aisles, a rectangular presbytery and a tiny pensile apse. Light from the window in the apse floods down on a terracotta representation of angels in high relief adore a representation of the holy name of Jesus. Other gilded angels suspended in the apse point the way to Heaven. The fresco (17th century) on the ceiling depicts the Resurrection of Christ. The gilded ceiling (1576) was repaired using original fragments after the fire of 1989. This panel on the high altar was removed at an unknown date before 1860 and subsequently lost. It was recently rediscovered in the parish church of Santa Maria in Case Bruciate, outside Perugia. It was subsequently restored, and the results of a 19th century “restoration” were reversed as far as possible. It was returned to the high altar in 2006. The inscription between the prophets reads “ANO IVBILEI MDLXXV”. ✴It has been attributed to Durante Alberti and dated to the time of the Jubilee in 1575. ✴However, other writers (including the guide referenced below) attributed it to the Flemish artist Michele Desubleo (1602-76). If this is correct, the painting must have been executed after 1630, when Desubleo arrived in Italy. (See the page on Durante Alberti for the relevant references). These documented frescoes by Giovanni Andrea Carlone, il Genovese are on the ceiling of the crossing. ✴the Adoration of the Magi. The church stands on the edge of an artificial terrace, with its pensile apse above three oratories that are built one above the other (illustrated above). These can be seen from terrace of the covered market, or by leaving Piazza Matteotti along Via Alessi and turning right into Via Angusta. ✴the Congregazione dei Contadini, for farmers or peasants. Only the last of these has its own entrance from outside the church. The other two can be reached from the stairs behind the door at the end of the left aisle (just before the crossing). This altarpiece on the altar is attributed to Pietro Rancanelli. 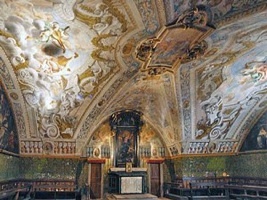 These frescoes by Cesare Sermei and Girolamo Martelli are on the ceiling. 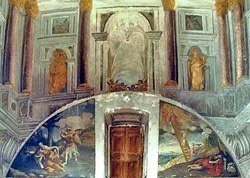 The perspectival frescoes in the upper registers of the walls (some of which can be seen in the photograph above) of the oratory are attributed to Pietro Carattoli. The altar (17th century), which is decorated by inlaid ivory and ebony, is by Fortunato Tedesco. This panel on the altar is by Francesco Amadei. This fresco at the centre of the ceiling is attributed to Cesare Sermei. The other frescoes on the ceiling, which also have Marian iconography, are by Antonio Maria Fabrizi and Giovanni Andrea Carlone, il Genovese. This lunette-shaped panel on the right wall is by Paolo Gismondi. The frescoes on the ceiling of the oratory, which are signed by Pier Francesco Colombati and dated by inscription, depict biblical figures set in perspectival architecture that includes a fictive lantern at the centre. Simonetto Anastagi had received this panel as a gift from the artist, Federico Barocci. It was transferred to the Vatican in 1773, at the time of the Jesuit suppression. It was lost for a period (and hence escaped expropriation by the French), but was rediscovered in 1909 and is now the Pinacoteca Vaticana. The panel actually depicts the Holy Family resting during their flight to Egypt: it takes its usual title from the fact that St Joseph is depicted picking cherries and giving them to the baby Jesus. It is one of a series that derive from a prototype (now lost) that Barocci painted for Duke Guidobaldo II della Rovere, Duke of Urbino: Duke Guidobaldo commissioned this prototype in 1570 as a present to Lucrezia d' Este on the occasion of her wedding to his son, the future Duke Francesco Maria II della Rovere. These two panels, which are attributed to Orazio Alfani, were recorded in the 18th century on the counter-façade of the church. Cards attached to them recorded that they formed part of the Anastagi bequest. They entered the Galleria Nazionale in 1863. An inscription on the back of this panel, which is attributed to Giovanni Battista Naldini, reveals that it also formed part of the Anastagi bequest. It was recorded in the sacristy in the late 17th century. Although Agostino Tofanelli, the Director of the Musei Capitolini selected it for dispatch to Rome in 1812, it was subsequently decided that it would remain in Perugia. It passed to the Accademia di Belle Arti in 1810 and is now in the Galleria Nazionale. The Commune and the confraternities dedicated to SS Dominic, Francis and Augustine commissioned this panel from Giovanni Antonio Scaramuccia in 1610 for the Perugian chapel of the Holy Rosary at Santa Maria degli Angeli, Assisi. He received payments for it in 1610 and again in 1614. 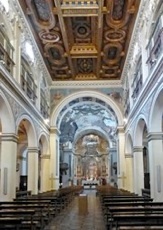 However, by the time that the panel was delivered in 1617, the Perugians had exchanged this chapel for the larger Cappella di Sant’ Antonio di Padova, and this was still in construction. 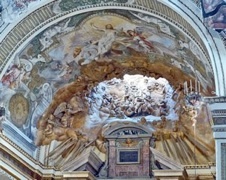 The panel was therefore taken to the Chiesa del Gesù in Perugia and then, in 1650, to the counter-facade of the Duomo. ✴SS Dominic, Augustine and Francis, the patrons of the Perugian confraternities that commissioned the panel. ✴the Martyrdom of St Stephen. They are now in the Galleria Nazionale. 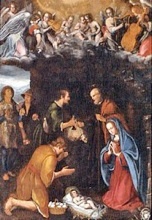 This panel from the convent, which is now in the deposit of the Galleria Nazionale, is attributed alternatively to Giulio Caporali or to the Venetian Pietro Malombra. It depicts Cardinal Fulvio della Corgna delivering the design for the new church to the Jesuits in 1561. The depiction of the facade of the church here was used in 1934, when the upper part of the facade was finally completed. Return to Monuments of Perugia.